The first two issues of this annual, edited by Silverberg/Haber were quick to press, and this third volume was equally so, digital version hitting the virtual streets pretty much as the last chords of ‘auld lang syne’ echoed down the New Year’s Eve virtual streets. With Silverberg no longer editing, Haber steps up to the plate as the lead editor, with Jonathan Strahan co-editing. Strahan has a good pedigree, of an antipodean nature, with regard to short SF, as we learn from the back cover, the inside front cover, and the short introduction to the volume. I mention this primarily to raise one beef with the volume, which is it appears to give every appearance of having the least amount of editing done to an anthology. OK, 15 stories have been selected for the volume, but you have to have 20/20 vision to read the miniscule print in the dense listing of story sources to find out where the stories originated from, and without -any- kind of introduction to each story the reader is left to their own devices with regard to who the authors are and why the stories were chosen. So what of the stories? Paolo Bacigalupi. The Fluted Girl. 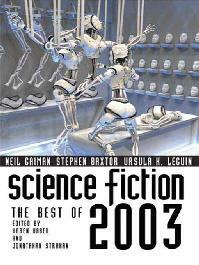 Originally in: Fantasy & Science Fiction, June 2003. After several wry stories, a proper lengthy SF/fantasy story. And a cracker it is too. A setting out of fairy-tale mythology, with a dark castle, a young, frightened girl, Lidia, and nasty adults. The Fluted Girl is a strange, fragile creature, the exact nature of which we only find out towards the end of the story – she has been forced to have many surgeries and treatment that have indeed made her a human flute. The music from her, and from her sister, is a music to die for, created through an incestuous sapphic performance fit for a queen. And the Queen is a wicked one, of course, and the young man who had loved Lidia and plotted the Queen’s downfall, but failed in its execution, is himself executed and served for dinner. But, as with most fairy tales, there is a happy(ish) ending, and Lidia turns the tables on the evil Queen. A selection with which I would agree. Neil Gaiman. A Study in Emerald. Originally in: Shadows of Baker Street (Del Rey, 2003). A Sherlock Holmes story with one or two differences. Firstly, the consulting detective and his friend operate in a London in which there are Cthulhian differences – some subtle ones, and some obvious ones (the grotesque nature of Queen Victoria for one). The Emerald blood which has been spilled (the first Holmes story was A Study in Scarlet) is that of royalty, and in true Holmesian style, the culprit has to be identified and brought to book. In the hands of an average writer you would have a passable story, but Gaiman is a better writer than most and he has one or clever tricks up the sleeves in which his hands are housed. Cory Doctorow and Charles Stross. Flowers from Alice. As Stross himself has said, ‘new’ is relative, and he has been plying his trade for some years now, which makes his appearance in a ‘New Voices’ volume wryly amusing. A clever piece of writing, and one that I’m glad Haber/Strahan have brought to my attention. David D. Levine. The Tale of the Golden Eagle. I was going to start this review by commenting that if the previous story was Runyon-esque, then this one could be Cordwainer Smith-esque. Then I spotted the mention that Levine was a recent winner of the James White Award for short SF by unpublished writers, so I checked back on my review of Nucleon, which appeared in Interzone, December 2001. I did this partly because the only recollection of the James White Award I had was a vague one of a story which I felt read as a story by a novice writer. In fact the story I was remembering was a previous White winner, for my review of Nucleon pointed out that unlike that previous story, Levine’s winning story was not obviously a first published story. But I did point out that Nucleon was somewhat Bradbury-esque. I’m not making a fuss about any kind of pattern in derivativeness, but merely point out the coincidence. Enough of the waffle – ‘The Tale of the Golden Eagle’ has that lyrical feel, of a story told many times over the millenia. As in ‘The Ship Who Sang’, intergalactic travel is made possible by giving a ship a biological brain. In this case, it is the brain of a Golden Eagle. And the ship in question lives through many centuries, ending up in reduced circumstances, before it is finally recognised for what it is and rescued. The AI is made free, to inhabit the body of a beautiful, though sexless, silver body. The gambler who gambles all to win the ship finds that his financial security requires the ship to be re-equipped with a biological brain. Can he bear to inflict on the now-mobile AI a return to its non-corporeal status? Indeed he cannot, but there is an alternative. And thus the myth of the ship with the beautiful silver lady as captain is born. A strong story, which suggests a bright future for Levine. And, having just written the preceding I took a quick peek at Bluejack’s review of this story, and dang it if he didn’t mention Cordwainer Smith and The Ship Who Sang in his review! So, again, no quibbles from me with the inclusion of this story. James Patrick Kelly. Bernardos House. Originally in: Asimovs, June 2003. When reading the rider at the beginning of the story “there are brief sexual scences in this story that may be disquieting to some’, I thought “only brief”? The POV character is indeed Bernardo’s House AI, which is struggling to cope with the long absence of its owner. Something has obviously happened, both to Bernardo and to society as a whole, but the AI is struggling gamely one, even after two years. A feisty young girl appears in the garden, and she and the AI begin to build a relationship, which ends with the AI coming to terms with the loss which she had been hiding from herself. I re-read the story in this volume and enjoyed it again, and would point out Kelly’s sparing use of future street-talk from the young girl, which was enough to make clear that this was a near-future girl without their being too much fancy language created to get in the way of the story. Ursula K Le Guin. Confusions of Uni. Originally in: Changing Planes (Harcourt Brace, 2003). An object lesson for those who travel to foreign (alien in this case) climes (and planes of existence) and find things just a little too different for their liking. A neat vignette in which a traveller with time to spare finds a trip to Uni just a little too mindboggling for comfort. Three typos in one paragraph on p136 would suggest the proofreader was daydreaming at the point they were looking at that page. Originally in: The New Yorker. My limited research shows that George Saunders writes regularly for the New Yorker magazine, and Jon (‘still online’ is not his first SF story, as he has at least one more under his belt – ‘My Flamboyant Grandson’ (similarly still online). Both are SFnal in that they are near-future musings on consumerist society. Here he posits an alarmingly feasible use of children brought up from infancy to be immersed in TV and advertising, and their reactions to this input is used as a marketing tool. A youngster finds love, but the girl with whom he fathers a child has designs on living on the outside of the hermetically sealed society. He has to find within him the hunger to leave behind the comfortable life he leads for a less secure life on the outside. Credit to Haber/Strahan from finding something from such an unusual source. Vernor Vinge. The Cookie Monster. Originally in: Analog, October 2003. Dixie Mae is pleased with her new job with a hi-tech company. However, a strange e-mail jolts her out of this situation. Something very strange is going on. Very strange. Dixie Mae and her colleagues set out to solve the mystery. It transpires that Dixie Mae is in fact an upload, and she and her colleagues are being run in a computer simulation. Time and time again. Vinge posits massive hardware and very clever software, and has an interesting idea, but the story comes across as being just a tad pedestrian – not least in that most of the action is in the form of the characters walking between office buildings! There’s a palpable lack of emotion as the characters find out that they are just uploads, and in one case a character come face to face with another instance of themselves, but takes it in her stride. Hark back to ‘For I Have No Mouth and I Must Scream..’ for a group of people memorably uploaded into a computer and the human reaction to that circumstance – written some 40 years ago? And there’s an awful lot of dialogue and tech discussion between the characters, which tends to get in the way of a story developing, and the ending is somewhat anti-climactic – the characters have worked out pretty much what is happening, but resolving it is the challenge on which the story ends. But having said that, I did finish the story thinking I was holding a copy of Asimovs in my hand, which puts the story some way ahead of the average Analog story. I tried to get into the story again in this volume, but again didn’t really get engaged with it. If you compare it with the Doctorow/Stross collaboration from earlier in the volume you can see what a couple of writers from a generation or two after Vinge can make of the potential for computational uploading. Vinge’s story could almost as easily have been based on people being shrunk and put into a miniaturised setting (ie very 1950s), or having been strapped down and immersed in a virtual world (ie very 1980s). Michael Swanwick. Legions in Time. A romp of an SF yarn, which could have been written completely straight for a chilling tale. However, for my money, the approach taken makes the story a better one for it. Eleanor Voigt’s job is a most peculiar one – she has to sit and watch a closed door all day long. But there is one condition – she must never open the door. Yup, you guessed it. She opens the door, and finds herself into a horrible, mechanised far-future with humanity evidently reduced to dull slavery. However, she meets up with a younger girl, from her future, and the pair find themselves playing a key, heroic role that will help save humanity from the terrors of the future. Stephen Baxter. The Chop Line. Originally in: Asimovs, December 2003. This issue of ‘mov’s escaped my grasp, and consequently I was glad to have got my hands on one story from the issue! Here is a case in question where the editors do the reader a disservice by not introducting the stories. This is a story from one of his ever-increasing sequences – the XeeLee sequence. In said sequence of stories, spanning a huge volume of space and time, humanity is fighting for its corner of the universe. The galactice scope of the battles are put in context by Baxter through very human dilemmas, and here is a case in question. A young ensign finds herself face to face with her future self, through a time paradox. Humanity has been successful in using intelligence from battles yet to be fought to help them with their military strategy. However, the future captain has committed a reckless act, and decisions have to be made as to whether the future from which she has returned is one that can be allowed to happen. Howard Waldrop. Calling Your Name. Janis Ian? Never heard of her. But it transpires that the reason behind a collection of stories based on her songs was that she was a big hit at the 2001 Worldcon. Anyhow, Waldrop conjures up a doozy in which an elderly widower gets an electric shock from a power tool in his workshop. Mind you, that shock is nothing compared to the one he gets when he gets back into his house, to find that the world he is living in is just a little different to the one he was used to. Whilst the changes are of the more obvious ones (slightly different wars, politicians, rock bands), it is the subtle changes in his family that effect him the most. A further electrical problem with his powertool evidently returns him home. But in a heartwarming twist which brought the tears to this soppy sentimentalists eyes, he is called back into the house by his most definitely alive wife. Dangnabit. Jeffrey Ford. The Empire of Ice Cream. I did try to read all the online stories on SCI FICTION last year, but only got as far as February! The medical condition of synesthesia appears for the second time in 2003 (Simon Ings’ ‘Elephant’, Asimovs Feb 2003). In this smooth story from Ford we experience the strange mix of sensations (hearing colours, tasting sounds) through a young man. He tells his story, from his earliest, to his last days. As a young man he finds out that coffee enables him to see a young woman…. Originally in: Trampoline (Small Beer Press, 2003). One of the few stories in this volume which didn’t work for me. Unlike Jim Kelly above, Mosser goes way too far with near future jive-talking streetargot, which gets in the way, big time, of the narrative. Narrative in that we essentially have a transcript of an interview with a combatant who rants about the moral decision she made in a recent operation. Lucius Shepard. Only Partly Here. Originally in: Asimovs, March 2003. I’ve taken exception with some of the stories published in the SF magazines which have tried to make sense of 9/11, in a couple of cases by using creaky SF devices to get those ‘responsible’ to face up to their actions and to regret those actions.Shepard addresses Ground Zero in a different way. A small team of workers on Ground Zero head off to a bar after each day’s work, each of them struggling with the aftermath and their own response to it. A young businesswoman is a regular at the bar, and she seems strangely out of place. The woman and the protagonist between them come to their own, and a shared, resolution. Not a clear-cut, resounding resolution which enables them to make sense of what happened, and why it happened and so forth. But a resolution which enables them to take another step away from that date. In her case, the step is a big one. A quick check (praise be to Google) shows that there -were- introductions to the stories, but these were withdrawn at a late stage to save space, and the intention is to ensure that they don’t get withdrawn with next year’s issue. In terms of content, a quite presentable collection of stories. Opinion appears to be divided with regard to the Vinge story – I am in the camp which thinks it pretty lame. But apart from that one and the Mosser story, a good go at doing the impossible (ie choosing a Years’ Best and only have a limited amount of space so to do).